I came to a place with the last cowl where I felt I had made too many mistakes and it needs to be frogged- mostly because I didn’t use a stitch marker. 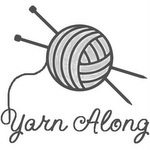 I’ve cast on again, this time with a much thicker, bulkier yarn on a larger size of needle. It has been going much better and faster, and I can’t wait to finish it. I never ever thought I’d get to wear it at this point, but there is still snow on the ground and strange weather all around, so I think it will see some use before it gets tucked away for the fall. 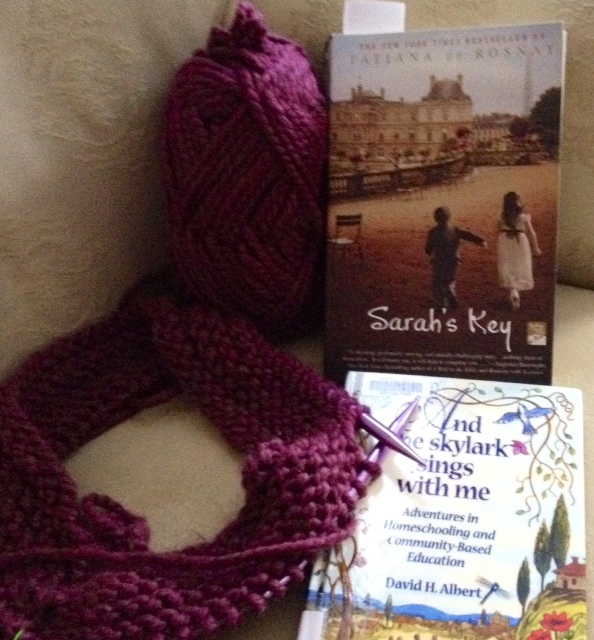 I just finished And the Skylark Sings with Me – Adventures in Homeschooling and Community-Based by David Albert. I really, really enjoyed this one, perhaps more than I was expecting to. I’ve read many, many homeschooling books over the years and I wasn’t particularly interested in reading another. This one was just so interesting to me- as much as I’ve read about interest-lead, project-based education, for some reason, this book helped me understand what it looked like. I should say, it’s not your typical ‘how-to-homeschool’ book either. It’s more of a memoir than anything else. I’m about a quarter of the way into Sarah’s Key. I can already tell this will be an uncomfortable book (dealing with the French treatment of Jews during World War II), and yet at the same time I can’t put it down. I want to know what happens next, even though I know the answer. Very good so far. Hello Joy. My daughter has juvenile rheumatoid arthritis, which is an autoimmune disease that often starts, for girls, before age 3. My daughter is 5 but was diagnosed at 2.5 years old. One form of it can cause strange daily or intermitten fevers, but there are usually swollen joints somewhere too. I noticed you mentioned they are looking at autoimmune issues. Did they mention JRA, per chance? I am saying a prayer that this is a short-lived viral problem only!